How closely do you look at pictures in books? Do you understand why your eye is drawn to something, or how you get an emotional impression from a picture? 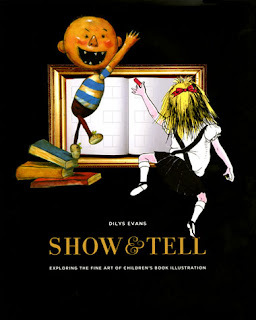 Depending on your answers, you might want to take a look at Show & Tell: Exploring the Fine Art of Children's Book Illustration by Dilys Evans. In this beautifully designed book, Evans examines the works of twelve different picture book illustrators, from giants like Hilary Knight and Trina Schart Hyman to newcomers like Betsy Lewin and Harry Bliss. Each artist is discussed in an eight to twelve-page spread, their own words and thoughts interspersed with reproductions of their art and Evans' elegant breakdown of what makes certain pictures work. For someone like me, who knows next to nothing about art, I came away with a much better understanding of what illustration is and how much it enhances a story. If, by contrast to the characters in Lane Smith's books, your reply to "Have you seen art?" is to say you don't know anyone named Art, you might want to check out Show & Tell and get a different answer to that question. I liked this very much too. Aren't the endpapers particularly lovely? What a neat idea -- that illustration is fine art. I'd love to see this book. I got this book for Christmas from my wonderful husband. He is such a clever fellow.